that take increasing prominent places on the future’s agenda. For this special issue of JMKL we are looking for papers considering these and similar issues critical for the future of education, industry, business and society itself. and submitted as e-mail attachment to claude.meier@fh-hwz.ch. Submissions deadline: 15 July 2019. Aims and Scope. 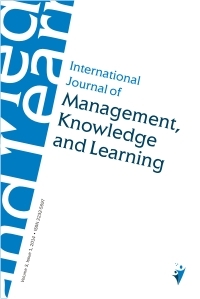 The International Journal of Management, Knowledge and Learning (IJMKL) aims to bring together the researchers and practitioners in business, education and other sectors to provide advanced knowledge in the areas of management, knowing and learning in organisations, education, business, social science, entrepreneurship, and innovation in businesses and others. It encourages the exchange of the latest academic research and provides all those involved in research and practice with news, research findings, case examples and discussions. It brings new ideas and offers practical case studies to researchers, practitioners, consultants, and doctoral students worldwide. The Journal is published biannually in June and December. IJMKL is supported by the Slovenian Research Agency. IJMKL is archived by the National and University Library of Slovenia. The manuscripts should be submitted as e-mail attachment to kristijan.breznik@mfdps.si. IJKML is an Open Access journal published under the terms of the Creative Commons CC BY-NC-ND 4.0 License. Copyright for all articles published in IJMKL is held by individual authors. Publication Fees. No article submission or article processing fees are charged.